With respect to the two words “general welfare,” I have always regarded them as qualified by the detail of powers connected with them. To take them in a literal and unlimited sense would be a metamorphosis of the Constitution into a character which there is a host of proofs was not contemplated by its creators. 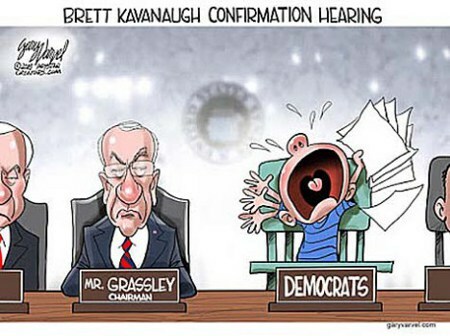 That’s the thing about seeing, reading of, and hearing the shameless, infantile, and mendacious screaming and squalling of the Dems during the pro forma confirmation hearings of Brett Kavanaugh; it’s equal parts annoying and enjoyable. Yes, hearing the representatives of our domestic enemies have tantrums and engage in behavior so far beneath what is expected of adults, much less people in positions of responsibility is both horrifying and gratifying in equal measure. While it is painful to experience, it perfectly showcases exactly what the worth of our enemies is. This entry was posted on Sunday, September 9th, 2018 at 10:14 am and is filed under Politics. You can leave a response, or trackback from your own site.